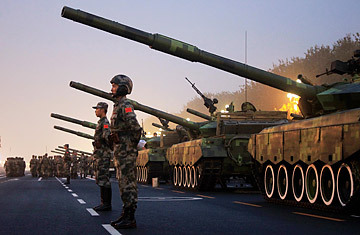 Should Europe Lift Its Arms Embargo on China? Barack Obama is not the only one with a China-size headache. Leaders in Europe have also tangled with Beijing recently on everything from trade to climate change to Iran. But perhaps the thorniest issue between Europe and China is the arms embargo that's been in place ever since the bloody suppression of the Tiananmen Square protests in 1989. The E.U. is now rethinking this 20-year-old arms ban. Spain, which holds the E.U. 's rotating presidency until July 1, has called for a review of the embargo as a way of improving relations with Beijing. "We are all aware of the new role which China is assuming in the world," said Spanish Foreign Minister Miguel Angel Moratinos. This is great news for China, especially given its fury over the recent decision by the U.S. to sell $6.4 billion worth of arms to Taiwan, which China regards as a renegade province. And Europe could certainly benefit from better relations with Beijing, which has been dismissive of E.U. diplomatic requests and disdainful of European attempts to be more of a global leader in recent years. In 2008, China canceled a summit with E.U. leaders after French President Nicolas Sarkozy met with the exiled Tibetan leader, the Dalai Lama. Then, last December, China executed a British citizen for drug-smuggling  the first European to be executed in China in 50 years  despite condemnations from the E.U. and pleas from supporters that he be spared because of his mental illness. And at last year's Copenhagen climate conference, E.U. leaders were shocked by China's scorn for European efforts at securing a meaningful commitment to cut emissions. The harsh tone from Beijing stings even more since the E.U. had hoped its new Lisbon Treaty  intended to create a more streamlined institution with a strong President and Foreign Minister speaking on its behalf  would ensure the bloc would have a bigger presence on the global stage. But China has historically sought to exploit the E.U. 's internal divisions to fuel its economic growth, not deal with the bloc as a whole. All of the E.U. 's biggest members have cozied up to Beijing at one point or another in the hopes of guaranteeing lucrative trade deals. But the tide is now turning in Europe. Charles Grant, director of the London-based Centre for European Reform, published a paper last month arguing that Europeans need to agree on a single message in their dealings with China so that Beijing can't play a game of divide and conquer. At the same time, he said, the E.U. should "abandon the fiction of a 'strategic partnership,'" which cannot be meaningful with such divergent value systems, and focus on a limited number of issues on which China and the E.U. can find agreement. Lifting the arms ban may not be so simple, however, with strong resistance already developing against the idea. Many E.U. countries are worried about China's increasingly threatening behavior toward Taiwan and are reluctant to sanction an arms buildup that would further isolate the island. France, for one, had called for the embargo to be lifted in 2004, but now says it should stay in place. The European Parliament is also opposed to ending the ban so long as Beijing continues to sell arms to countries like Zimbabwe and Sudan, whose governments the West accuses of committing or supporting violent acts against civilians. And the E.U. would also have to think carefully about antagonizing the U.S., which has its own arms embargo on China. François Godement, a senior policy fellow with the European Council on Foreign Relations and president of the Asia Centre at the Institut d'Etudes Politiques in Paris, says the Spanish bid to review the embargo is especially ill-conceived since there has been no mention of trying to squeeze concessions from China first. "There seems to be some expectation of future Chinese goodwill of an unspecified nature," he says. "But China has steadfastly refused to give anything in exchange." Godement says Europeans have long deluded themselves that China will accept them as equal partners when, in fact, Beijing will likely continue probing the bloc for weaknesses and division. He says the ban should only be lifted after Europe takes a long and hard look at its China policy. "If there is one good thing about China's strident tone, it has been to help the E.U. 's big countries realize that they cannot go it alone and they need a united front," he says. See TIME's photo-essay "China on the Wild Side."